The Clare Controls CM-MT series switch driver lets you integrate the following Clare Controls HDMI matrix switches into your ELAN g! project. 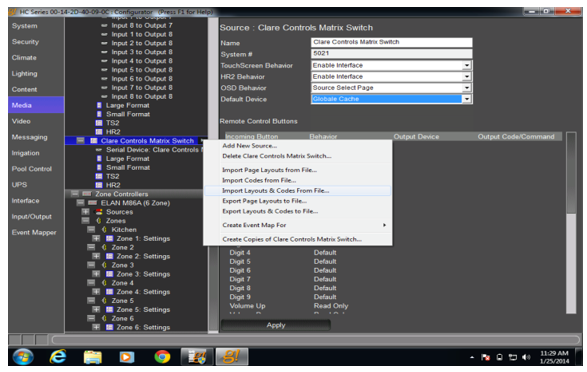 You can connect your Clare Controls CM-MT series switch to an ELAN g! controller two ways. You can connect the switch directly to the ELAN g! controller’s internal serial port (Figure 1), or you can connect the switch to the IP network (Figure 2). To connect to the IP network, you will need to attach an IP-to-Serial device, such as a Global Cache’ iTach device. Before you begin configuring your project, ensure the ELAN g! controller is set up on your network. Note: ELAN g! training and the g!Tools program are required for programing. 1. Locate your ELAN g! controller on the network. 2. Add a communications device, and then select one of the internal RS-232 ports, or an IP-to-Serial device, such as a Global Caché IP-to-Serial device. 3. 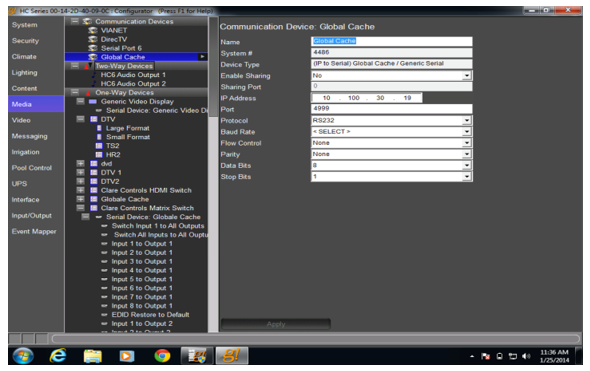 Using the g!Tools software, enter a name, IP address, and port number for the communication device, as shown below. 1. 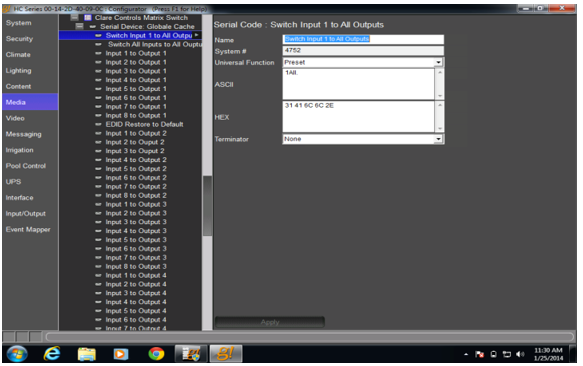 In the Add New Interface dialog, enter a name for the interface, and then click Create New Serial Device. 3. Open the device, and then select your communication method. 1. Click the arrow to display the pop-up menu for the device. 2. 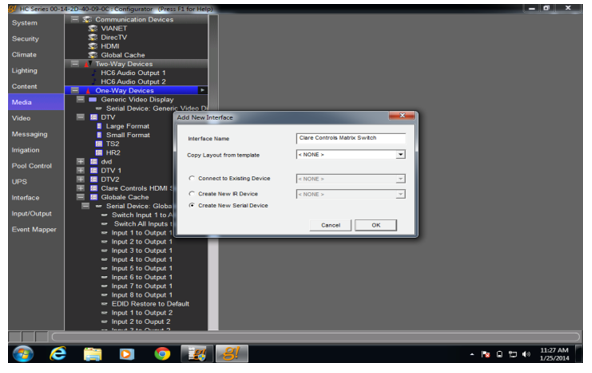 Click Import Layouts & Codes From File. 3. Select the Clare Controls Driver from your computer, and then click Open. 1. 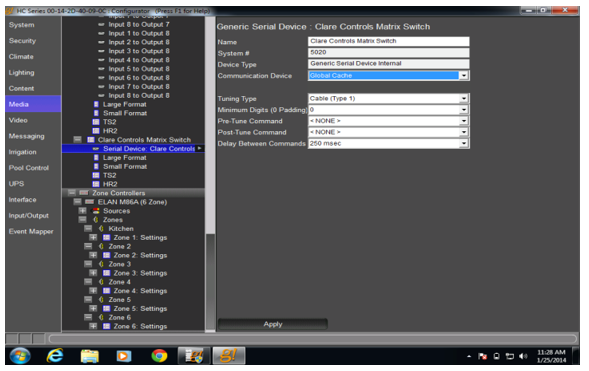 Click the arrow to display the pop-up menu for the device command. 2. Click Test Command. The command is sent from the ELAN g! controller to the HDMI switch.